The ongoing conflict in Syria has been on the front page of news for a variety of reasons, not least of which is the huge number of Syrian refugees who have fled their homes to find solace in Jordan, Turkey, and other neighboring countries. But what is the definition of a refugee? How many refugees are there around the world? What causes people to become refugees? 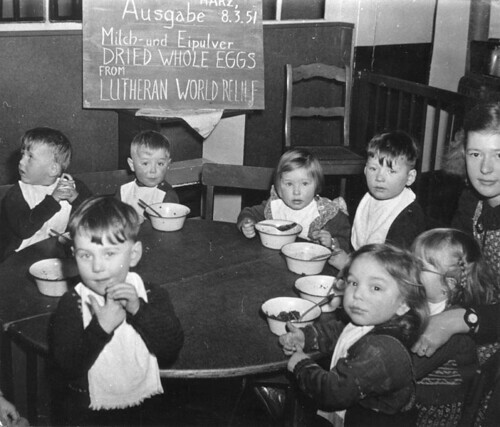 Lutheran World Relief was founded in 1945 as a way for Lutherans in the United States to send aid and relief to their (often literal) brothers and sisters in Europe affected by the War. The United Nations High Commissioner for Refugees (UNHCR) was formed in 1950 to help the 40 million refugees across Europe. [source] Both organizations had the intention of closing up shop within a few years, but have continued their missions over the past sixty years as new needs have arisen. The conflicts in Afghanistan and Pakistan over the past decade have caused millions of people to flee their countries. But many are also beginning to return home. Over the past ten years, nearly 6 million refugees have moved back into Afghanistan. [source] However, there is still a huge concern for the safety and wellbeing of people moving in and out of this region, and humanitarian access is limited. From prevention to solution, various Lutheran churches and organizations each play important roles in the life of refugees. LWR works in countries to end the conditions that often spiral downward, helping people living in poverty earn more income, find a voice in their community and avoid harassment or cruelty. When people are forced to leave their home country, Lutherans are there to help. LWR and the Lutheran World Federation help Sudanese refugees at the Kakuma camp, Somali refugees in Dadaab, both in northern Kenya. We help Karen refugees on the border of Burma and Thailand. And we are sending Quilts & Kits to provide basic needs for many of the current Syrian refugees. A family displays one of their LWR Quilts inside their bamboo shelter at Mae La, the largest of nine camps that serve Burmese refugees along the Thai-Burma border. But it doesn’t stop there. Lutheran Immigration and Refugee Services is a force in helping refugees from around the world get settled in the United States, with the services and support they need to thrive. The easiest, most efficient way for you to help is to give an unrestricted gift to Lutheran World Relief. This gives us the flexibility to use your gift where it's most needed. You can also make LWR Quilts & Kits that will be shipped to people in need around the world. Or you can provide the funding needed to ship Quilts & Kits.